SCHERERVILLE | An Italian beef and Italian sausage restaurant beloved in the South Suburbs for more than four decades is finally opening a Northwest Indiana location. 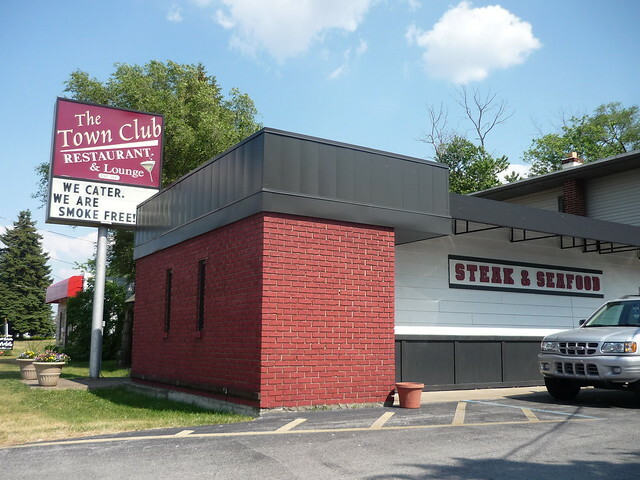 Enzo's Restaurant, which is known for charbroiling freshly house-made sausage over lump coal, is taking over the former Schererville Gyros, which closed earlier this year. The restaurant's first location outside of its home base of Chicago Heights will be at 1120 U.S. 30 in Schererville, and open sometime next month. Owners Lisa Hallberg, her husband Kevin Hallberg and their son Kyle Hallberg have big expansion plans for the business, which they took over in 2011 after founders Enzo and Nita retired. Enzo was an Italian immigrant who built the restaurant's brick oven by hand and sought out the best ingredients he could afford to grind and stuff his sausages. The recipes haven't changed, but the new generation has added new menu items like thin and deep-dish pizza made with plum tomatoes that they sell by the slice. This was from August. They should be opening any day. HIGHLAND | Soup's on in Highland. A new fast-casual soup restaurant plans to open this year in a new strip mall in the Highland Meijer Plaza at 10140 Indianapolis Blvd., across the street from the Highland Grove Shopping Center. Franchisees Steve and Diane Crnokrak have signed a lease to open a Zoup! Fresh Soup Co. location. The Detroit area-based chain offers sandwiches, salads and hundreds of soups, such as Chicken Potpie and Lobster Bisque. Zoup! always has 12 rotating daily varieties, including vegetarian, dairy-free, gluten-free and low-fat options. Soup comes with a hunk of freshly baked bread, and is also available for catering for 10 or more people. "Zoup! is a unique concept with healthy menu options including soups and delicious sandwiches which we are confident will be a welcomed addition to our community," Steve Crnokrak said. The Highland restaurant would be Zoup! 's second in the state. jbw wrote: "This July I moved to Chesterton Indiana . . . "
JBW- i just saw your post. Thanks for the suggestions. I've heard good things about Octave Grill. I hope to check it out soon. I've been to Dog Days Ice Cream with my family several times now but have not yet tried the salty-caramel-cashew-fudge. I just signed up for the Fourth Street Theater mailing list as well and look forward to attending their production in November. Funny, when in Chicago, I rarely attended plays despite the amazing access I had to them. Now, I really have a desire to support the businesses in Chesterton. Thanks again! So on a tip from my dentist, last night I checked out Smokey's Southern Barbecue which is located on 375 US-20 in Chesterton, IN. He claimed that they had great brisket although I was warned that they are a family run business and tend to open and close as they please despite their posted hours. It's best to call ahead to make sure 1) they are open and 2) they have the dish you're hoping for as "when it's GONE, it's GONE" (as stated on their website). I guess the luck of the bbq gods were with me last night because Smokey's was open and serving up brisket. The owner explained that for the next 1.5 weeks he's serving a short menu. Last night's menu consisted of pulled pork, brisket, chicken noodle soup, sides (potato salad, coleslaw, parsley and chive potatoes, baked beans), and rib tips. On his normal menu, it looks like he also offers smoked chicken breast, smoked sirloin sandwich, red beans and rice, soup of the day, chili and desserts (no particular type specified). I opted for the pulled pork and brisket dinner with sides of potatoes, baked beans and potato salad (he was out of coleslaw). This weekend he'll have baby-back ribs so I hope to come back and check those out. The dinners come with a roll and choice of two sides and the total was about $29 dollars plus change. The portions were generous- enough to feed my 2 older boys and myself. Smokey's offers up house made spicy and regular bbq sauce. I got a bit of both. I found them to be on the more vinegary side. Very good, but in the end I loved the flavor of the meat so much, I didn't even feel I needed the sauce. I was also told by another customer that their house made mustard sauce is amazing. I plan to try that next time. I found the brisket to be extremely flavorful and moist- probably about the moistest I've ever had. It also had some nice bits of fat on the edges which I really love. Same outcome with the pulled pork. This bbq did not have an extremely smokey flavor; in fact was the least smokey of all the bbq I've ever tried which was fine with me. The potatoes were diced and baked I think and then coated in generous amounts of green onion and butter. These were quite tasty. The baked beans were very sweet- too sweet for my taste. I loved the potato salad and this is from a girl who's not a big potato salad fan. Nice chunks of onion and celery and a great balance of mustard and mayo. I was very pleased with Smokeys. The restaurant is on the smaller side; probably seats about 20. It's very cute inside and definitely screams family-run. The owner had a sign up his children had made advertising tomatoes from their garden for sale. I can't wait to check out the rest of the menu. Note- this place is CASH ONLY and there is no atm located inside. The closest one the owner could direct me to was at a gas station probably a mile away. Jimmy's Famous Burgers opening in the former Demi K's spot next to Bombers BBQ. Signage up windows still papered over. They also have a location in Dolton,Il which I've visited. I'm kinda sad to see that Anthony's (18 years), and Niko's (30+ years) are now gone. I hope they make it but sadly that location has been the kiss of death for one restaurant after another. Dans is well known from all the festivals so that may help them stay afloat. Very true. Ive seen this store front change about 10 different times. Im going to Highland on Tuesday for VHS hunting and Lincolns Sandwiches and i already know Dans Pierogie are good so ill stop by there as well. Been finding myself over in NW Indiana quite a bit the last month or so - the past 2 weekends as the matter of fact- - hit mostly spots from some of the lake perch explorations in the area profiled here on LTH - Enjoyed a couple visits to smokey Chuck and Irenes for cheap drafts and beer, also have hit Traditions for some fine Lake perch and drinks(a tip of the Sox hat to: Bottoms Up in Lansing - a quick cruise away from NWI is doing up some good perch as well - cant say the same for the Lansing Knights of Columbus). lots of fun and good eats to be had in this area - just gotta poke around. jimswside wrote: Been finding myself over in NW Indiana quite a bit the last month or so - the past 2 weekends as the matter of fact- - hit mostly spots from some of the lake perch explorations in the area profiled here on LTH - Enjoyed a couple visits to smokey Chuck and Irenes for cheap drafts and beer, also have hit Traditions for some fine Lake perch and drinks(a tip of the Sox hat to: Bottoms Up in Lansing - a quick cruise away from NWI is doing up some good perch as well - cant say the same for the Lansing Knights of Columbus). 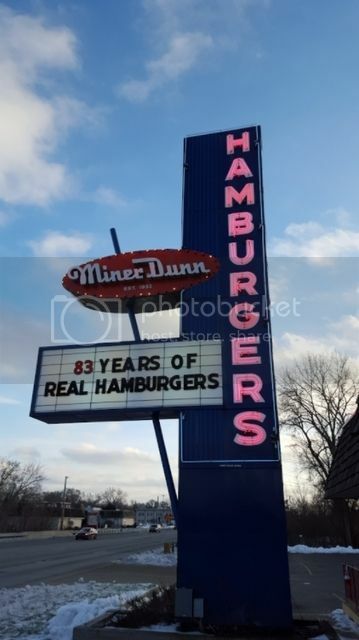 Cheesy beef at Miner Dunn is an excellent choice! I used to live down in Lansing/Calumet City and i agree with you on Bottoms up for decent perch. That place at night gets seriously sketchy and i used to love going there and getting in trouble. I hit up Lincolns in Highland yesterday and the U.S. Steel Sandwich was on point! I can not say the same for my girlfriends turkey sandwich. The bread they use now for most of the subs is just awful. The rolls sort of remind me of a Submarine Pier roll, but i went to Lincolns for the ol french bread they used to use! What a bummer. But hey the U.S. Steel on rye hit the spot. Went on over to Francos for a few mid day cold ones and watched Jeopardy with a bunch of old regulars. One guy could not stop yelling out "what is, a shitter!" to ever daily double. I thought it was funny. Also hit up Dans Pierogie and got some take homes for later that night. Love their pierogie! Nice thin lil polish dumplings with great fillings. Highly recommended. Doc's Smokehouse & Craft Bar brings Dyer more than 60 craft beers on tap, 100 bourbons and whiskeys, and authentic southern-style barbecue that's smoked exclusively with hickory and dry rub. The new restaurant and craft beer bar at 1420 Calumet Ave seats 100, plus another 40 or 50 on a patio that will open this summer. Dr. Himanshu Doshi and lifelong restaurateur Brent Brashier, an Alabama native who worked for years in the foodie town of Austin Texas, launched the eatery, which specializes in locally sourced brisket, ribs and other meats. There are still a couple cat's out on the prowl. Spied R-Bar & Grill in Highland as a spot that had an affordable Friday night lake perch offering, checking their menu further I saw a "From the Euro Grill" - section - Sweet.... Burek, Sopska, Pljeskavica, and yes - one of my favorite things - Cevaps(or "cheevaps" as the girl at the bar told me). On a tip from the bartender at Hunters Brewery in Chesterton, IN, I discovered Albano's Pasta Shop, also in Chesterton; the chef is Nick Albano. I was told that it has only been open for a few weeks and serves lunch and dinner only on Thursday, Friday, and Saturdays (currently). It shares a space right next door to Running Vines Winery which is at 119 South Calumet Road, Chesterton, IN 46304. The dishes were fantastic; perfectly seasoned; pasta not overcooked, and the flavors spot on. The ingredients are locally sourced, including the pasta flour. Nick makes the pasta by hand and you can watch him cooking it on his little burners in the open kitchen. There are a few tables available, although I anticipate that once the word spreads about his pasta, it's going to be difficult to get a table. Prices are fair, about $14-16 per entree, and homemade bread comes with each one. Highly recommend this place. I cannot wait to try more of his dishes this week. jimswside wrote: Spied R-Bar & Grill in Highland as a spot that had an affordable Friday night lake perch offering, checking their menu further I saw a "From the Euro Grill" - section - Sweet.... Burek, Sopska, Pljeskavica, and yes - one of my favorite things - Cevaps(or "cheevaps" as the girl at the bar told me). R-Bar makes a decent batch of deep fried tacos but there's better to be found in and around NW Indiana and East Chicago. Most of all which are doc'd upthread. Somehow I thought I had gone thru them all but it turns out that The Town Club in Highland has it's own taco night as well. I've been into the TC a handful of times and always love it's old school charm and the menu which includes some excellent lake perch plates and sandwiches. But I never knew of taco night until we walked in on a Wednesday which happens to be the night. Having not seen anyone eating them I decided to go ahead and get one ($3) without asking what they were. Fingers crossed they were the signature style of these parts. Even though these are a bit different than the standard style found around here they're still fried tacos and thus I enjoyed my single serving. Flour tortillas are lightly fried and steak replaces the standard ground beef and while it does gets semi dry it also gets well crisped. A little bit of salsa, sour cream, as well as a nice amount of melted cheese on the bottom made up for dryness. Lettuce, tomato, cheese go on top. 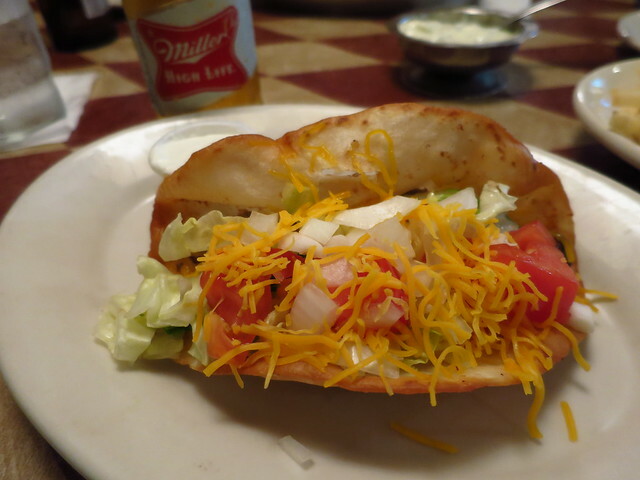 I thought this was a nice Midwest style Fried Taco. When I walked to the restroom I noticed a newspaper article about the tacos. So the story goes the then owner was inspired by some tacos he ate in Jamaica (lol) back in 1963. He then decided to put something similar to them on the menu at TC as a way to compete with some of the other spots in the area that we're starting to serve Mexican food. His niche was right as customers started to flock here on Wednesdays for his unique lightly fried steak tacos. 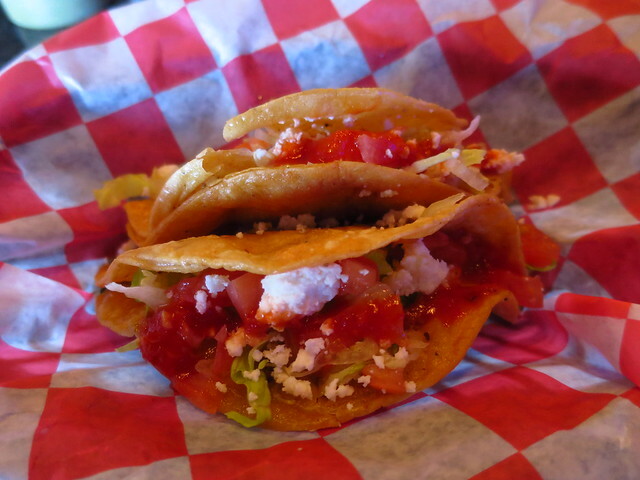 Could this be the taco that triggered the trend in NWI? Probably not but it's a good to one to pair in a 1-2 punch with the legendary Loncar's who also does their taco night on Wednesdays. 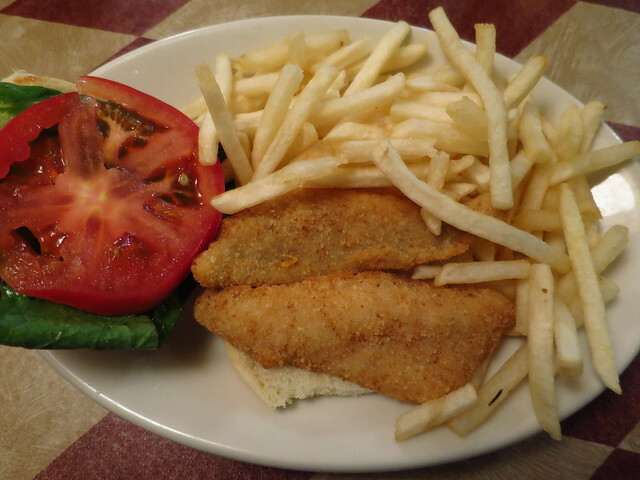 The readily available Lake Perch sandwich was on point as always. We were going to try Doc's, but we got outf of town earlier than we expected, and it felt like it was too soon for dinner. A few minutes later, we're getting to Merrillville, and realizing it's nothing but fast food for the next two hours of driving, so we stopped, and fretted over the offerings in the neighborhood of the Star Plaza. Not being in love with anything there, I searched for BBQ and found Collins Smokehouse only ten minutes away. The building was cold, we were the only ones eating in, but the food was great, huge portions for reasonable prices. Brisket (weekends only) had good smoke, tender, on Texas toast with fries for $9. Hot links were $8 and change for a 'small' that was huge. Less wonderful was the mac and cheese, which was mushy and not very cheesy (very buttery though). I asked what Turkey Tips are, and the woman at the counter brought us a sample: smoked, chopped thigh meat, delicious. Definitely with a stop if you're in the area. Ha! I was just about to put this up! It's going into the old Church's Chicken. The owner worked for years at the Fireside Inn. After 9 years of trying to find decent food in NWI, I found a place hiding in plain sight--Mishkenut in Munster (next to Schoops in the little strip mall). There is a mention or two of it in other threads but no write up--I'm going to fix that. Mike and I had time to kill last night before an 8:00 p.m. game at the Munster Babe Ruth field so in googling for ideas, I came across a few Yelp and Trip Advisor recs for this spot. Professional-looking website. Fairly standard med/middle eastern menu. No frills dining room. And--low and behold--excellent rustic, but carefully prepared, food with a few extra flourishes. No pics but I'll fix that next time. We ordered a LOT and took a lot home (to the extent that I had to run to Jewel after dinner to buy a cooler since I didn't have one with me and it was too hot a night to leave everything in the car for a few hours without one). We started with an order of babaganoush and hummus. Both outstanding. The baba was perfectly smoked, with minimal, if any tahini so it still had the texture of eggplant. Hummus was silky smooth, very flavorful and properly salted. Both were topped with excellent olive oil and a drizzling of pureed Schug, the m/e green chili condiment. I asked for more of the Schug later and got a different version that was more chunks of pepper--but still very tasty. The hummus was also dusted with a bit of good quality sumac. Next we ordered the white salad (lettuce, tomato, cukes, feta and a thick vinaigrette type dressing with herbs (something sweetish like maybe allspice included) and the tabouli (standard style, very fresh, very lemony, devoured). The White salad was HUGE--nothing really special, but fresh, with good feta. Dressing was served on the side without being requested, but was appreciated, since it would've been a soggy mess to take home if dressed. Last, we had the vegetable entree (lightly sauteed mixed veg--golden carrot slices, broccoli, cauliflower, onions topped with melted feta over yellow rice that almost had the texture of orzo. We also had the chicken schwarma which I'm not 100% sure was actually shaved off a cone, since the pieces were the right size but not really "sliced"-more rounded. But definitely had been in some kind of marinated state. Perfectly seasoned, juicy, also served over the terrific rice. Completely stuffed and took home 2 full containers for the entrees and half the salad, so no room for dessert, but they brought us each a chilled, homemade piece of dark chocolate with almonds that was the perfect, decadent finish. All of this food was only $50. And we have, probably, at least 2-3 more meals. Chatted with the owner for a bit--they briefly opened a spot called Mish Grill, with an identical menu, on Ashland in Wicker Park that didn't work out. As someone posted in the DLD thread, the father had a restaurant in Jerusalem years ago that may have been a bit of a hot spot (son noted that Carroll O'Connor once ate there LOL!!) Sorry I missed the city spot but it is fantastic to discover this place, featuring well-prepared and delicious middle eastern fare for a very reasonable price in an area without a ton of healthful options. As the man says, Mishkenut--count me a fan!!! boudreaulicious wrote: After 9 years of trying to find decent food in NWI, I found a place hiding in plain sight--Mishkenut in Munster (next to Schoops in the little strip mall). There is a mention or two of it in other threads but no write up--I'm going to fix that. 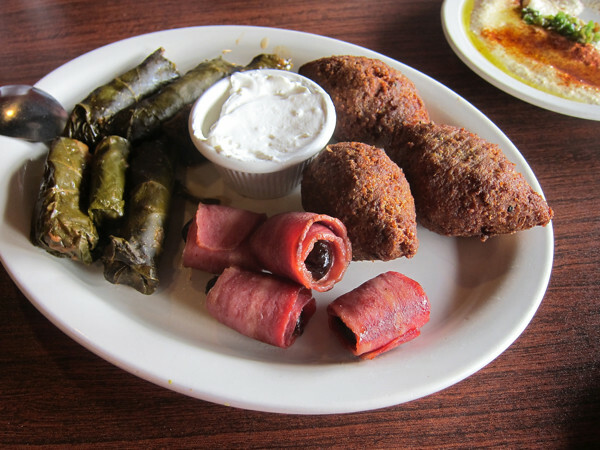 Last autumn, before burgers at Schoop's, we tried a few appetizers at Mishkenut. We didn't try many things, so I shouldn't say much. One oddity on the menu is worth documenting. Those cylindrical things are prune rolls – dry-as-can-be turkey bacon wrapped around a pitted prune. I wouldn't have been able to live with myself had I not tried them, but I don't see more prune rolls in my future. GARY — A potato chip Region residents have snacked on for nearly 90 years will soon disappear. Peerless Potato Chips, which was founded in Gary right before The Great Depression, recently went out of business. It struggled after Central Grocers, its main distributor, filed for bankruptcy. Its owner also is being treated for terminal lung cancer, and he couldn't find a buyer. "After 89 years in business we have been forced to close our doors," owner John Hogg said. "We can no longer pay our suppliers so can no longer produce. The Central Grocer's bankruptcy was the straw that broke the camel's back." Peerless has gradually lost shelf space at Strack & Van Til supermarkets since Central Grocers acquired the Highland-based grocer in the late 1990s, Hogg said. Jewel-Osco recently also stopped stocking Peerless chips, moving unsold bags to backrooms and demanding the company issue credits. The moment everyone has been waiting for!!! The date of the grand reopening has yet to be announced. My son plays soccer with a young man whose grandfather owns Little Market, a Mexican market plus catering business. I stopped by for the first time on Saturday and picked a dozen homemade pork tamales, and a dozen chicken tamales. Each pack was about 13.00. They were large and delicious. They also had some homemade cactus salad which was fantastic and complimented the tamales perfectly. In the back, they had self-serve barbacoa and carnitas which customers were packing up into Styrofoam containers for a convenient take out meal. There was homemade salsa, guacamole, and elotes. According to the facebook page, it looks like they serve ceviche at times as well. I would definitely check out this place. It's near the Crown Point Sportsplex and Sparta Dome. About 2 weeks ago I had checked out Phil's Caribbean Cuisine in Schererville, Indiana. It's relatively new, very spacious and clean, and the owner is very nice. You order up front and then take a seat. it's not a fancy operation; food was served in Styrofoam containers but it's very tasty. We ordered oxtail stew, brown stew chicken, jerk tacos, shark tacos, and whole fried snapper. The oxtail and chicken were on point; lots of flavor, and large portions. The dinners came with choice of two sides including callaloo , mac and cheese, sweet potatoes, beans and rice, and plantains. My husband thought the snapper was good - it's so difficult to get whole fish in NWI so we were excited by this dish. My son liked his jerk tacos. The tacos come with basically a salad inside of them- lots of lettuce, bell peppers, tomato, shredded cheese. The shark taco was forgettable in my opinion. Tasted a bit fishy and again, covered up with the salad which didn't do much for the dish. I would definitely return for the oxtails, chicken and snapper. NWI doesn't offer much in the way of Jamaican food so it's nice to have this option available within about a 45 minute drive of where I live (Chesterton). GRIFFITH — You can't keep a good hoagie down. Romano's, the so-called Home of the Hoagie, has reopened at a new location in Griffith after closing earlier this year. The 70-year-old pizzeria that's known for its ham hoagie has reopened at 1927 W 45th St. in the Grifflands Plaza strip mall in Griffith. Lines stretched out the door when it reopened Monday, and its phone lines have been swamped since it returned after a few months' absence. The eatery closed earlier this year after a new owner acquired its longtime home at Broad Street and 61st Avenue in rural Griffith sold the building, which is being turned into the Shipwreck Bar & Grill, a Florida beach-themed seafood restaurant. A Region institution, Romano's dates back to 1948 in Highland, when it first opened by the now-bygone Town Theatre. The purveyor of traditional Italian specialties sells pizza, pasta, salads, burgers and appetizers such as fried zucchini, fried cauliflower, breaded mushrooms, garlic bread, and mac and cheese wedges. Specialty pizzas included the King Supreme, the spicy Hot Stuff and the Meat-a-tarian that's loaded with sausage, pepperoni, ham and bacon pieces. 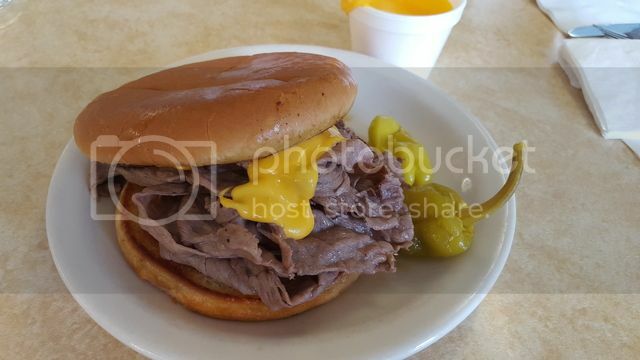 It's well known for its sandwiches, including a ribeye steak hoagie, a meatball sub, and Italian sausage and beef combo, and its famous ham hoagie, which stuffs fresh Vienna Bread with imported Polish ham and a secret blend of pizza cheese. Romano's is open from 4 p.m. to 12 a.m. Mondays through Thursdays, from 4 p.m. to 1 a.m. Fridays and Saturdays, and from 4 p.m. to 10:30 p.m. Sundays. For more information, call 219-838-1731. If anyone is interested Scheeringa Farms is selling Heirloom tomatoes for $1.59 lb. A buyer is interested in purchasing the assets of the potato chip company, which was founded by a steelworker who lost a finger at Carnegie Steel just before the Great Depression in 1928. "There hasn’t been a closing on any sale," said Patrick Kepchar, an accountant who represents Peerless in the sale of its assets, as well as the potential buyer. "We do, however, have a buyer that we are going through the process with currently, and it looks promising, but again, nothing has been finalized just yet." If the deal does go through, Kepchar said it would be a "rise from the ashes story of one of the Region’s most favored snack food companies." Albano's Pasta Shop has moved from Chesterton to Valparaiso. The owner makes his pasta from scratch. It is excellent.